Tom Kenny has been working to get out of Cat 5 for quite a while now, and with the current point awarding structure and low amount of races, it can be quite difficult. He has officially upgraded !! Congrats dude! Clothing Order #2 and some STC inventory to get rid of. I am about to unleash Clothing Order #2, however I have some jerseys, jackets, and shorts that have accumulated in my basement the last 2 years from me making a few mistakes while ordering. The club will fire sale these (mainly to get them out of my basement) and then I'll open up Clothing Order #2 a few days later. OK, here is how we can do this. Here is a link to a shared document. If you want something shown, DO NOT change the quantity, just put your name in the column on the right. If there is more than one available, you can put your name more if you want more, or someone else can put their name in the next column. Also indicate what size you want, so people know it is spoken for. Please DO NOT change the values in the quantity columns! UPDATE, I have the clothes down in The Engine Room. I have the clothes down at The Engine Room with an envelope and you can pick up the clothes and put your cheque (made out to 'Speed Theory Cycling') or cash in envelope during store hours. Great turnout! 18 cyclists and Marie came out to volunteer! Thank you Marie! I will post some photos as soon as I download them! Thanks to everyone who came out, it was fun! For those not going to the Provincial Championships, let's all get together Saturday morning for a fun tradition we do with the club and friends! Usually the TdF starts with a short Time Trial called a Prologue. It serves the purpose to establish a position of every rider, since the next several days are usually sprint stages and end in groups. It is usually around 5 - 9km. Last year, the Tour of Alberta started with the Prologue for example. Last year we all met at the Timmies on 85th St. and 9th Ave and we rode down towards the Edge school by the small Airport. We have a course set up we have used on multiple occasions that is 6 km long and is usually with a tailwind and is predominately downhill !! Let's meet at 8:45am and meander down to the course together. We will explain how it works and set everyone off one by one. This is a casual affair and meant as much for a big club get together as it is for a solid interval. So don't be intimidated to come out. If you don't feel like doing the 6km Interval but want to take part in the ride, that is totally cool too! and if you want to drive out there to cheer, we may get you on a clock for timing! If you are NOT an STC member but like the sound of doing something cool on Sat morning, come out for sure as long as you belong to another ABA club! It would be cool to get several Crankmasters there! See a lot of you Sat! and if you are doing the Provincial Championships, GOOD LUCK !! It's only fitting that Trev won this, Victoria is where he first developed his love for riding. The total event was 265KMs with the race portion covering 231kms of the event. After the 231km mark it was a neutral ride into the city. Trev covered the 231km's in 6:52:50 and what's interesting he did this with basically no time off the bike. It's my assertion that he learned the technique of flying in and out of feed-stations/controls/rest stops while Randonneuring with the hardy men and women of Arizona. Regardless, a very impressive feat given the terrain and a big congratulations to him. It should also be mentioned that Markus Navikenas, Scott Bratt, Nelson Whitmore finished the tough ride in 9:34 an impressive feat in itself. We're in the midst of planning the epic 2014 Jay Lap weekend, and before we get too deep into the process we'd like your feedback. Please fill out a (very) short three question survey here. P.S. If you are interested in volunteering, the volunteer sign-up page will be available soon. This weekend Jenn, Erin, and myself travelled up to Devon for our first ABA road race. It was a BLAST! All of three of us were nervous, probably more than we would admit about what to expect. Having two other familiar faces at the start line helped to calm our nerves I think. After a warning from the commissaire about the massive potholes on the road, we were off. Things seemed good as we tucked in the middle of the group. The next thing I knew, I had hit a huge pothole and my front tire was flat. I could hear Jenn and Erin saying they were sorry as I grabbed a wheel from the wheel car. Thankfully, this was only on kilometre 3 and the ladies at the front weren't pushing too hard so I TT'd back up to the group. As we turned onto the highway, we knew the Cat 3 women from Bici would attack, but we were ready and held on. We stayed together until the first climb where things got spicy with another attack from Bici. Just when we thought the climb was over, there was more attacking as the road meandered along a false flat. Jenn and I managed to stay with the peloton and Erin who was only seconds back worked with a few other girls to try and bridge back to us. The group seemed to ease up in between rollers which was a nice little break. Just before the turn around, ladies started dropping off the back as the wind changed. At that point I looked around and realized my teammates were no longer with me. As we looped back to start the return, Jenn made an amazing move to join me and Erin, still working to catch us was close behind. We hit the second climb on the way back where QOM points were awarded. This was around kilometre 45 and my legs were screaming. Despite our best efforts to keep up with the Cat 3 women, things got pretty split up after this point. I worked with two ladies from Edmonton to try and catch back on, but to no avail. I came sprinting through the finish line, with what I am told was a "smile" on my face...really it was a pain face (think Andy Schleck in the Tour) and Jenn and Erin not too far behind me. I am very proud of us for getting out and representing the women in STC!! It was a ton of fun. I hope that some of the ladies out there who are nervous or unsure of this whole race thing will come and give it a try!! We would be so happy to have you join us. A BIG thanks to Marie who hosted us at her place for an intro to racing night last week. Many of your tips and suggestions came in handy this weekend. Victoria Gran Fondo tomorrow as well! Sat June 21st. A few of us from the club, Scott, Nelson, Markus, and I, are doing the Victoria Gran Fondo tomorrow. I have wanted to do this event since 2009 when it was first offered. The logging road from Port Renfrew to Lake Cowichan was paved the year before and of course, some cyclist like ourselves thought... 'Hey.. that would be a crazy awesome loop!. Here is a link to the course route. It is 270km, but on there is says 263km due to some route discrepancies. The official end to the race portion is at the top of the Shawnigan Lake climb about 225km into it, then it is neutralized down the Malahat and into town. 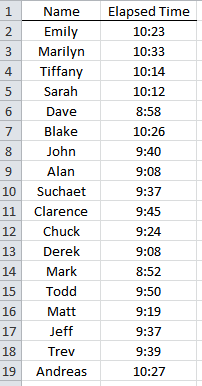 Last year Fast-Legs Frank crushed it for an 8th spot in 7 hours 34 min, just 2 min behind the winner. Then made it to the final finish in just more than 9 hours. The race director emailed out that the support vehicles and motorbikes will have SPOT satellite devices on them and that friends can watch the progress of the groups throughout the day. No promises, it may not work, but here is the link that should come live tomorrow at 6am Victoria. Devon Grand Prix is this weekend! Hi Crew! Just starting off a roll call and room sharing blog for those who are making the run up to Edmonton this weekend. This is a great intro race, as it's short and sweet for all categories. In light of Pigeon lake being cancelled, let's support our Edmonton race organizers and teams. While you are there, you can hype up the J-Lap! [Update by Trev:] Here is the link to the technical guide for Devon. There is a Criterium and a Road Race. The Crit is on Sat afternoon and the RR is on Sunday morning. A lot of the racers stay at the Airport Hotels in Leduc. Tom or Ernie, can you post the hotel you are staying at? It looks like there are a good group going up. Tom is staying at the Executive Express hotel in Leduc. There is a Boston Pizza at 5309 50th Ave. Tom, Ernie, and Dan will meet the club there Saturday night at 6:00 for Pizza. The club will pay for the Appy's and Beer for a group dinner on Sat. 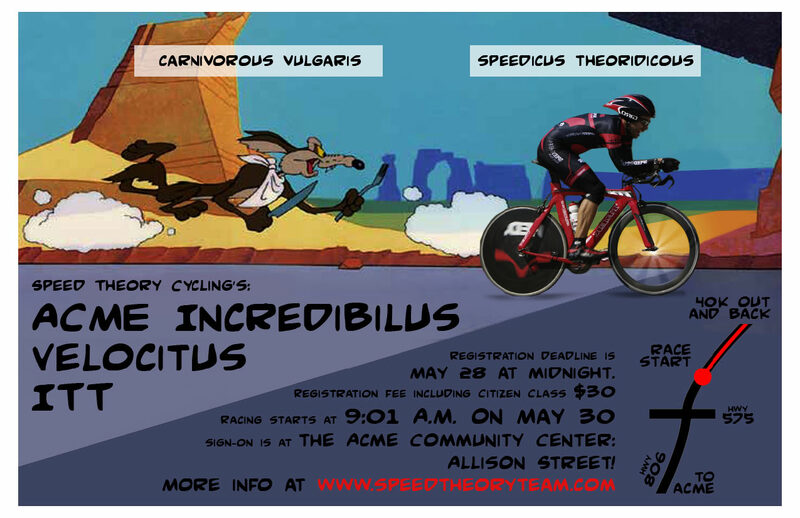 If you have never raced before, there are a good showing of Cat5's from our club there, so this would be a great opportunity! Zinatelli on his 2nd place in the Cat 5 ITT on Saturday morning. Excellent work! Women's night at Marie's. Be there! June 17th at 6pm. Reminder, if you are a women in STC you are going to Marie's tomorrow night for some wine and some fun talking about cycling! Read this post from a couple weeks ago and get a hold of Marie to tell her you are coming! Alberta Bicycle Association Casino Nights: Aug. 17th and 18th. Our cycling governing body is the recipient of two casino evenings and has asked that clubs ask their members if they would consider helping out on a shift. The dates are August 17th and 18th. Please email Heather here if you would like more info and a list of possible times you can help. Speed Theory Cycling, with the generous help from The Crankmasters, host the Jason Lapierre Memorial cycling weekend from Aug 8th - 10th. Volunteering or providing a volunteer for this event is extremely encouraged when joining the club. This event is the 'first priority' on your volunteering schedule! Banff Bike Fest - Who's In? Time to get this roster going. Who's coming to Banff? Comment below. June 12 Thursday night skills now posted in training form. In lieu of Pigeon Lake being cancelled, I propose we have a spirited big group ride. We could, for example; send out the Cat 1/2/3s out on the loop for 4 laps and maybe 5 minutes later the 4/5/women for three laps. Or just one big group, depending on who shows up. Anyone else can join in and do a lap or two for fun and giggles. This way you can ride with similar category riders without waiting for the slower riders in a group setting. We can recollect at the park for a confab after. Meet at Brown Lowery Provincial Park (see the map) at 10:00 am. If you are planning to do the Banff Bike Fest ITT, be aware that due to road construction the course has been changed from the Lake Minnewanka Road to the Vermillion Lakes Road. This means the course is significantly shorter (8 km instead of 21 km) and very flat. Details here. My hope (as discussed at the AGM) was to hold a women’s learn to race weekend. Due to injury I have not been able to put this together in as timely of manner as I had hoped. Recently, my thought was to have as many new racers attend the ABA Learn To Race Seminar as possible and then hold a talk after this to discuss the idiosyncrasies of women’s racing in Alberta. I see that this seminar has been removed from the ABA website. With some really great races around the corner, I’m sure some of you are really excited to be ready for Devon GP or Stampede RR! A night of info and Q&A for new racers who are keen to get going! Tues June 17, 6-9pm at my house. Light refreshments and beverages of course are included and this is a no-charge clinic. All I ask is that you come out and try at least 1 race! Please RSVP in the comments section of this post for ONE of the dates… unless you really want to hang out and then by all means, RSVP for both! Just a reminder Thursday Night Skills nights are now on and being posted on the training form. Today is the last day for 'Early Bird' pricing for Banff Bike fest. 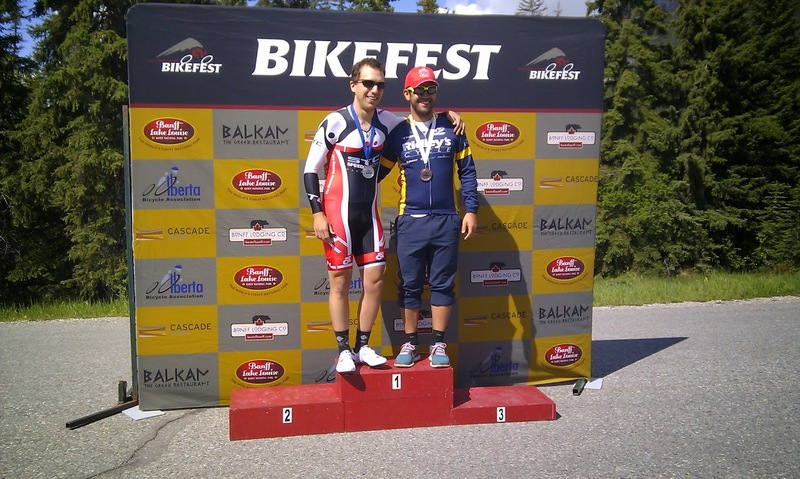 Make sure to register by this evening for all the events you are going to race in for Banff Bike Fest. The prices go up tonight! If you have any questions, shoot them in the comments and one of the vets will answer it. Essentially, most people should consider doing the Sat morning ITT as a bare minimum. Then you can bring your family out and watch the Criteriums in the evening if you are not participating in those. They are pretty cool to see! For those club members that are looking to learn from better cyclists and get in a great ride, the Wheelers Ride is going well already this Spring. There were 12 in attendance last Sat. You can follow the link to the theory of the Wheelers ride up above, but the main points are that good cyclists (from any club) show up and get in a real warm up while showing less experienced riders (from any club) how to be safe and smart in a group, how to pace line, and real group etiquette. Then on Airport Road, there is a King of the Mountain right on the hump before the 22, so the pace will pick up when turning left by the Edge School. If you are a good rider, come out and get in a solid session, if you are a new / lower ability-level rider, come out and learn a few things from experienced cyclists. Once on Airport Road, try to stay with the higher ability cyclists as long as possible to learn real tactics, paces, gearing, and so on. Then when you're dropped, have a great ride through Cochrane and back to the Timmies parking lot with the others that were dropped and look forward next week. I hope to be there this week if I am not racing Iron Maiden XC. So maybe see you there!